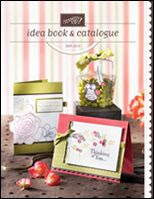 The new catalogue that is and it is gorgeous. Love the new In Colors. I have already used all of the Pacific Point cardstock that I was able to pre-order. Guess what will be in my first order (along with a whole lot of other goodies too). The accessories are amazing and there are so many. So to help you (and me) to get a range of accessories I am organising some product shares. This share will include a one third share of the Flower Fusion Too tin. This includes over 40 flet flowers in three colours, Pink Pirouette, Baja Breeze and Chocolate Chip. 20 buttons (1 each of the Button Bouquet and Button Latte range from page 151.
see pages 148 and 149 of the catalogue for pictures. Everyone who joins the shares will have their name entered in the draw to win a Level 1 Hostess Set from the new catalogue. Every share you purchase gets you another entry. Postage will be at my cost to get the items to you (most economical way possible of course). I'll be back later with a Paper and Ribbon share.